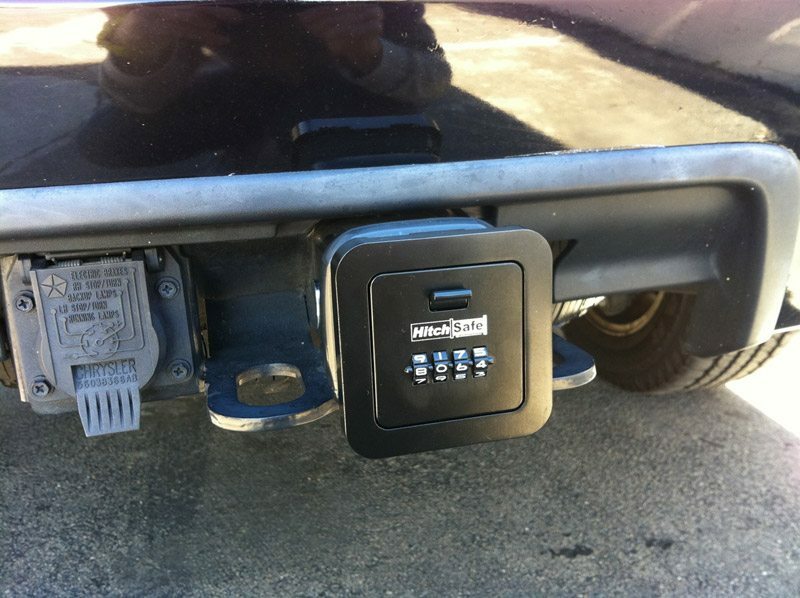 The Hitch Safe turns your car’s hitch into a small safe where you can place keys, money, and other valuables. It’s a great place to stash an extra key, and an even greater place to put your keys when you’re surfing. I used to put my old metal key in my wetsuit key pocket, and that worked fine. But there were a few close calls where it was dangling around when I took my wetsuit off, and I always wondered when the other shoe would drop and I’d lose it completely. I hate putting my key in the leash cuff, so this was my only option. Forget hiding the key near the car… I can do that back home on the East Coast but not here in Encinitas. Even if you’re not a surfer, the Hitch Safe is a great way to stash stuff when you’re going out for any sort of activity, whether it’s snowboarding (I hated carrying my keys around snowboarding), hunting, diving, hiking, mountain biking, etc. Anything you’re doing where there’s a chance that either a.) the keys will fall out of your pocket, or b.) you’ll fall on the keys and they’ll stab you in the leg. I also think one of the best things about the Hitch Safe is that if you’re surfing with your buddy and he gets cold, you don’t have to follow him in or toss him the key while in the water. As long as he knows the combo he can get dry and warm while you enjoy a few more waves. The Hitch Safe was easy to install. Actually, the hardest thing about setting it up was getting it out of that horrid molded plastic packaging (note to manufacturers: please don’t do this). Make sure you have a sharp powerful scissors on hand, or perhaps an angry pet gorilla. The lock mechanism allows you to set your own four number combination. It’s really quite easy. The only downside is that obviously you can’t use your hitch for towing if you’ve got it installed. The safe comes with a removable dust cover so that the lock mechanisms stay protected. So far I have been loving this product. I don’t have to worry about my keys while out surfing, knowing they are safe and dry right at my car. The only thing I haven’t been able to test out is it’s durability as far as the lock mechanism and normal wear and tear / weather. Obviously salt water and normal rain water would be of some concern, so I definitely suggest keeping that dust cover over the face at all times. Overall this is a great Christmas gift for a surfer in your life. Just make sure they have a hitch on their car that’s available and not being used. It’s half a year later since I wrote this review (time flies when you’re having fun!) and I continue to tell my friends that the Hitch Safe is the best thing I’ve ever bought in terms of surfy / car related gadgets. It’s incredibly helpful. Not only for surfing – if I go out to a club, or leave my car overnight somewhere when I go on a trip, I can leave my keys stashed in here and don’t have to worry about losing them somewhere. I’ve used it for snowboarding (who wants keys in their snowboard pockets?) and hiking. I definitely suggest that if you have a hitch, you get one of these bad boys. Great product, been using it for 3 or 4 years now. If you loose the dust cover (which I’ve done twice now) they will replace it for a small fee. Looks like a good product – I’ve got a Surf Lock which works on same principle but you don’t need to have a tow-hitch (just a secure, accessible anchor point). No major complaints about Surf Lock although Hitch Lock looks like it might have more room inside it.